Whats the story with these things. I know they've been in production for millions of years it seems, but when did they first show up? I know they started to reappear in the 90's. What happened to the Mummy on all the recent boxes? He's gone. anyone have an extra Mummy box I could snag?? Also whats the easiest way to tell if you have a vintage box or a 90'+ box? The only thing I can tell is a lack of detail in the Monsters picture and the boxes only say "Candy". The old ones said "Candy Cigarettes". I remember them from the late 60's, so they date back at least that far. The older ones have more muted colors, and say "cigarettes", but to say one box is definitely from the 60's... we'd have to have one with a known provenance and that has not come to exist so far. 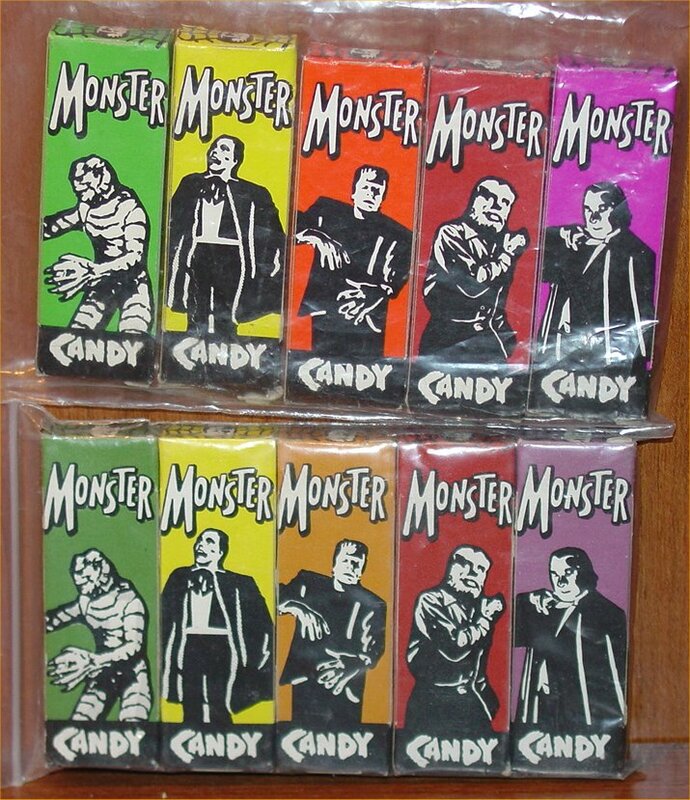 The Monster Candy was indeed first produced as "Candy Cigarettes", Shawn (Zombophoto) should be able to help us out in that dept., as well as the older ones with the Mummy on them. 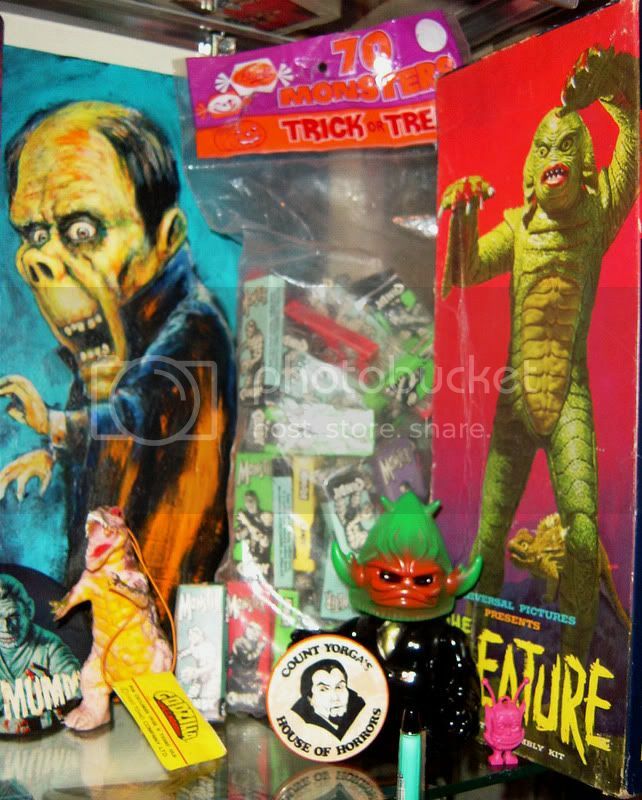 The Mummy disappeared from the assortment sometime in the early 80s I believe, when the background colors of the boxes was changed (the Creature went from blue to green, and the Mummy, which had been green, went to intangible). I've only got one Mummy left from the bag that was bought from me in the 80s, otherwise I'd be glad to assist. Anyone else know anything about 'em? Beyond the swap in colors, you can see the printing difference quite readily on many, with the color filed being a tight dot pattern on older ones in ,my experience. LOL! I was just about to post those very same pics and the warning screen came up telling me somebody else just posted a new message! Good thing I checked before posting mine! I really have a sweet tooth for this kind of monster candy. The ones on top are newer, the bottom are older. Creature box up there is blue. I haven't seen a blue one before... that might just be the ticket. You're right about the Mummy too... no Mummy in the later ones. In the last few years, the Wolf Man has gone from brown to a blue background. Yup, I found some this year with blue Wolfmen. The Frankies seem to fluctuate in color. I've gotten a few in different shades of orange in the same bag. Were these things ever licensed? Whats the story on those Monster candy and toy boxes? What toy came in the box? Those things are great BTW. 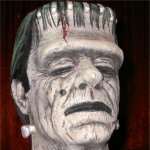 Terry, I love those Phoenix candy boxes (the Frankenstein posted), I just wish I had some of them! 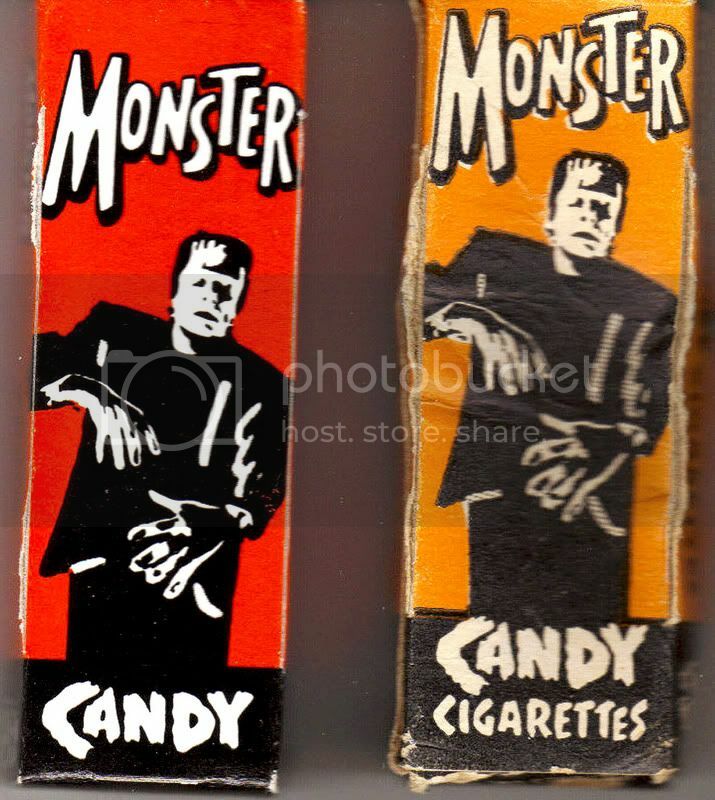 The Monster candy was indeed produced one time as MONSTER CANDY CIGARETTES, however I've only ever seen a Frankenstein box with these 3 words on it and that's in my collection. The CIGARETTE version box differs from the regular CANDY version box in a few ways. First obviously is the inclusion of the word CIGARETTE on the front, back and one side of the box. Second, on the bottom end of the box is the following information (which is not on the regular CANDY version box or at least not any that I've seen or own): c 1963 Universal Pictures Co. Inc. Other than that the boxes are the same, ingredients, size and design wise. Here is a scan of the 2 different boxes (the one on the left is actually a newer box as I don't own a loose older version Frankenstein). I own an unopened bag of the 60's CANDY version boxes. It contains 70 boxes with I believe 13 or 14 Mummy boxes (it's been awhile since I counted). The original Mummy boxes don't pop up very often and when they do I believe they go for a good bit. Here is a photo containing the bag. Sorry it's not a better picture but since my camera is dead this is as good as it's gonna get for now. I would love to know more about the CIGARETTE version. Did they do the other monsters in this style as well? Wow Zombo~! Nice! Thanks for the pics and info!